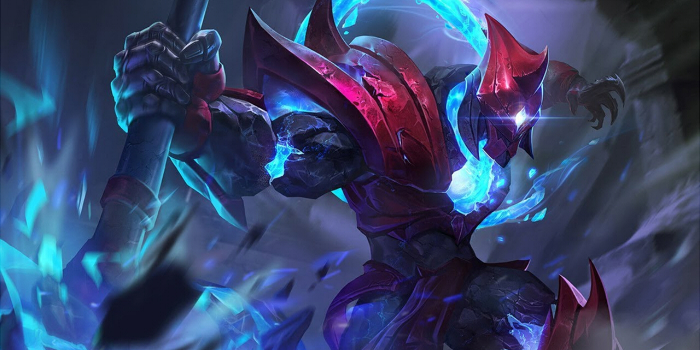 A guide to Arena of Valor's Arduin, the Spirit. Arduin is a hearty bruiser capable of jumping into enemy teams and disrupting them with his mighty ax. Arduin is a warrior/tank hero with the capability of jumping inside the enemy front lines and stunning everyone in his path. His gargantuan axe serves as his weapon and is able to smash the ground to wreak havoc on unsuspecting enemies. His abilities and playstyle can place him as a tank, a bruiser, or even a support. Great at Flipping Fights – Between the lifesteal that he gains from Bloodlust and the shield provided by Undying Protector, Arduin is great at winning engagements even if coming in from behind. Engaging on opponents when appearing weakened can cause them to overcommit to an unfavorable trade. Versatile – Arduin can act as a tank or a bruiser depending on his item build. This allows him to adapt to the enemy’s strategy and more effectively fill any holes that his team might have. Great Control – Both Cull and Rend stun enemies affected as they deal damage. This gives him a lot of ways to keep enemies closeby and unable to escape when chasing them or in team fights. Team Dependent – While he has a decent damage output, Arduin’s crowd control abilities require a follow up to maximize their potential. Arduin should not be picked in teams that lack the damage to pick off disabled foes. Unreliable Passive – His passive is strong in certain situations, but he must be in a very dangerous spot in order for it to activate. It’s automatic activation and long cooldown can lead to Arduin not being able to capitalize on Bloodlust’s effect. Don’t be afraid to engage in trades, especially against melee heroes. Bloodlust can surprise enemies when they try to dive you. Use this to your advantage and bait enemies into jumping on you, using your abilities to punish their aggression. Undying Protector is good for both clearing minion waves and harassing enemy heroes. Don’t forget to use the true damage enhanced auto attacks afterward to harass heroes and shorten the ability’s cooldown time. You need to be somewhat aggressive when using Arduin, as most of his abilities require you to deal damage or lose health for their maximum potential. Undying Protector is generally a better skill to max before Rend, scaling better throughout the game and benefitting more from levels. If you want to play Arduin as a semi-support or full tank, take Rend at level 1 before maxing Undying Protector. The knock-up effect can disrupt enemies, set up fights, or offer allies a chance to escape. Ganking – Use Cull to jump in, following it up with Rend and Undying Protector to damage and stun the target further. Continue with normal attacks in order to benefit from Undying Protector’s true damage. Ganking as an Arduin is not that difficult, provided you land Cull. It’s better, however, to have teammates who can follow up his initiate nearby as Arduin is unable to deal lethal amounts of damage alone. Solo Battles – Arduin’s passive makes him strong in solo battles. Use this to your advantage to bully enemise who lack burst abilities. Arduin will be able to land his abilities easily in solo fights, especially when fighting low mobility heroes. Team Fights – Rend is very powerful in team fights as it can stun multiple enemies in a large area. Use Cull to enter or initiate team fights and time Rend as to hit multiple enemies. Escaping Fights – Use Cull to escape, knocking the enemy up with Rend if able to get a bit of additional time to run. Undying Protector can help protect Arduin from any pokes the enemy may use to try and finish Arduin off. BLOODLUST – Passive – – If Arduin’s HP falls below 50%, Arduin will enter Bloodlust mode for 8 seconds. While in Bloodlust mode, Arduin restores 4% of his maximum HP when his abilities or normal attacks damage enemies. This effect has a 45-second cooldown. This lets Arduin flip fights that he would otherwise be losing. Bait enemies into fighting when your health is low. REND – Arduin swings his axe, sending out an energy arch that deals 250/300/350/400/450/500(+1.0 AD) physical damage and slows enemy movement speed by 40% for 2 seconds. If Arduin hits an enemy hero, he can also smash his axe into the ground to deal 250/300/350/400/450/500 (+1.0 AD) physical damage and knock enemies into the air for 1 second. Be careful when aiming Rend so that both instances of the ability are available. This ability can hit multiple enemies, making it a strong way to initiate team fights. Use Cull to approach the enemy team before using Rend twice to stun the enemies. UNDYING PROTECTOR – Arduin summons a shield that has 12% of his own maximum HP, which lasts 5 seconds. When the shield is summoned, Arduin deals 200/225/250/275/300/325(+0.75 AD) magic damage to surrounding enemies. Within 8 seconds deal an additional 100/125/150/175/200/225 true damage, and each time his normal attacks damage an enemy, the cooldown time for Cull is reduced by 1 second. Undying Protector is great for clearing the minion wave and increasing your presence in team fights. Don’t forget to auto attack while Undying Protector is active in order to take advantage of the true damage the ability provides. CULL – Arduin flings his axe forward dealing 300/425/550 (+1.2 AD) physical damage and stunning the first enemy hit for 1.5 seconds. He then hurls towards the axe’s spot, dealing 300/425/550 (+1.2 AD) physical damage to surrounding enemies. Once Cull is activated, control effects will not stop Arduin from completing the ability. This ability is a great initiating and escape tool. You can use it to engage by casting it on an enemy and following up with Rend. The initial instance of damage is the only one with an associated control effect. While Cull will stop travelling after hitting an enemy, it does not require striking an enemy to trigger the movement effect. Cull has a relatively short cooldown, so feel free to use it to initiate, escape, or in the middle of fights for extra damage. Arduin is a strong warrior, but if his abilities miss, he won’t have much left to offer to his team. You can try to disable or kite him, keeping your distance while slowly whittling away his HP. Arduin’s Undying Protector summons a shield and deals damage as well. Try to distance yourself when he is using his Undying Protector and re-engage when it’s on cooldown. Arduin can run a high-offense arcana build of Indomitable, Guerilla, and Skewer. This allows him to carve chunks of HP away from enemies whenever he hits them. Defensive-minded players can go with Indomitable, Benevolence, and Mythril to make him exceptionally tanky. Arduin has a good chance of winning against tanks, his abilities giving him a lot of power in extended fights. Undying Protector also allows Arduin to deal true damage, ignoring the target’s defense stats. In team fights, however, it’s best to ignore the tanks and focus on the carries. Warriors fight similarly to tanks, except their stats are more balanced compared to the more defensively focused tanks. Let your passive and the true damage from Undying Protector do their work in giving you a lead. It’s also recommended that you go all-in against the enemy whenever your passive is up. Arduin is durable enough to give assassins trouble, but is not immune to the bursts of those who have been able to farm well. Mitigate some of their damage with Undying Protector and interrupt their combos with Rend and Cull. Surviving their initial burst is key, as your sustained damage will be very dangerous after an assassin has used up their combo. Mages are a huge threat to Arduin, as they can burst him down before he can benefit from his passive. Don’t let a mage finish off their combo by using Rend or Cull to stun them. Try to mitigate some of their burst damage with Undying Protector. Marksmen are squishy targets and thereby easy for Arduin to kill. Furthermore, these ranged damage dealers should be top priority in team fights and ganks. Be sure to stop them from getting away with Rend and Cull. You might not be able to kill them by yourself, especially if the marksman is good at kiting, but a single successful stun is usually enough for your teammates to score a kill. Supports are also easy targets for Arduin when they are alone. Experienced supports usually stick close to the carry, however, and therefore can be difficult to deal with. If you see a support alone, kill them immediately. Otherwise, feel free to engage after ensuring that they aren’t acting as a trap.